I love trying new recipes! I guess that is why I have a food blog. I love finding recipes and having them turn out just like I had hoped! So when my sister in law asked me to make her a birthday cake I was really excited. She wanted a strawberry cake with strawberry whipped cream frosting and strawberries on top. I had never made a strawberry cake before so I had to make sure I did it right. Most of the recipes I found out there called for strawberry jello. I didn't really want to use jello. I wanted the cake to be full of real strawberries. After lots and lots of searches I finally found one that sounded good. I knew if the cake was good, the rest would be easy. After I poured the batter into the pans I (of course) had to try the left overs in the bowl and they were amazing. I kinda didn't even want to cook the cake. My husband agreed, but the logical side took over and we decided to cook the cake. After eating the cake my husband told me that this cake might be his favorite cake. I will agree that this cake is quite delicious! It was so fun to have a fruity delicious cake even if it is mid winter! It was kinda funny because both my husband and I thought that the other person had taken a picture of the cake. So right before we were about to eat it with the family we realized that we didn't have a picture yet. We had very high hopes that this cake would be amazing and just knew if we didn't have a picture of it we would greatly regret it. So all of us took out our phones and started snapping pictures of it. I think our phones did a pretty good job considering its a phone! 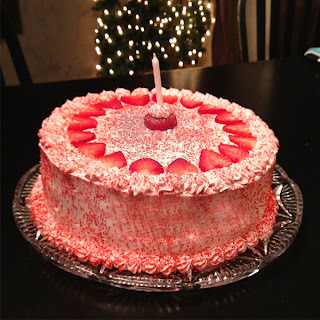 A completely from-scratch, fresh strawberry cake. No jello, food coloring, or artificial flavors! Thaw frozen strawberries in whatever form (sliced, whole, etc) and in whatever container/bag you have them in. Pour into a fine strainer placed over a bowl and let sit. Lightly toss the strawberries occasionally to remove any pockets of excess liquid. Reserve the liquid for another use or discard. Reserve 3/4 cup puree for the cake. Use leftover puree to fill the cake or fold into the frosting, if desired. It's also fabulous spooned over ice cream... and eaten straight with a spoon. In small bowl, combine puree, milk, egg, vanilla and mix with fork until well blended. In bowl of stand mixer, add sifted flour, sugar, baking powder and salt and mix to combine. Continue beating at slow speed and add butter. Mix until combined and resembling moist crumbs. Add liquids and beat at medium speed for about 1 minute or until full and evenly combined. Stop mixer to scrape down the sides of the bowl and hand beat for 30 more seconds. Divide the batter evenly among the pans and smooth tops. Bake for about 25 minutes or until a toothpick inserted in the center comes out clean (time will vary). Let cakes rest in pan for about 10 minutes and turn out onto wire racks. Let cakes cool completely (about 2 hours). Once cooled trim cake and place filling on top of bottom layer. Top with second layer and frost. In a large bowl combine cream cheese, sugar, salt and vanilla. Beat until smooth. Gradually add strawberry puree until you get your desired color and strawberry flavor of frosting. Fold in whipped cream. Frost cake as desired. *Note: This is a very soft light frosting. I was able to frost a 2 layer cake with it and pipe with it a small amount, but this is not an ideal frosting for piping, but it is an ideal frosting for eating so do with it as you please. It is hard to get fresh fruit flavor to stand up in a cake, it usually disappears when baking, so I am really impressed to see this recipe. Like you I know that artificial flavor all too well and hate it. I would love the fresh fruit taste of this cake-yum!. Also your presentation is amazing. Tell your sister in law happy birthday, she is lucky to have received this wonderful cake! Enjoy the season. WHOA!! This cake is amazing!! And the fact that you got all this strawberry flavor with out adding any fake stuff is incredible! What a beautiful cake! I love the strawberries included in every step! Yum! This looks so fresh and incredible with the strawberries running through each layer. Delicious. I'm curious, what does the lining the outside of the baking pan do? I've been baking since I was 9 and this is the first time I've ever heard this. Thanks!